Former world champions Peter "Kid Chocolate" Quillin and Caleb "Golden" Truax fought to a no-decision in an IBF super middleweight title eliminator that headlined Premier Boxing Champions on FS1 and FOX Deportes Saturday night from The Armory in Minneapolis. Quillin, who won both of the first two rounds on all three scorecards, was disappointed in the result but understood the doctor's decision. "First of all, I think the doctor's job is to make sure the fighter is safe," said Quillin. "That's number one. People would rather see him fight without an eye, but I'd rather have the guy be able to fight another day." 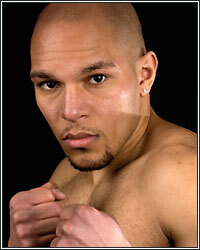 "It's disappointing I couldn't put on a good fight for the fans," said Truax. "They came to see 12 rounds of action. It hurts but that's boxing. I'm flattered that everybody came out for me. The fans are doing a great job representing how strong our boxing community is. This is one of the best times in decades for Minnesota boxing. "My cutman tells me it's pretty bad so I'm going to have to take a little time off and get some stitches. I'll heal up and see what's next." "I want to do it again with Truax here in Minnesota or come back to Brooklyn, my home," said Quillin. "Let him get stitched up. Me and my trainer will be back in the gym on Monday. We didn't get the sweat in, we didn't get to do anything tonight. We'll be back in the gym Monday and be dedicated and will wait for the phone to ring." "I was extremely happy to get six rounds in," said Spencer. "This is the first time I've gone six rounds. This guy was tough and kept walking through everything. That was what I needed. I hadn't experienced that yet in a fight." "He was very durable and I just had to keep fighting until the end," said Spencer. "I love fighting here in Minnesota, it's becoming my second home. I'm going to get back in the gym and be back soon and continue to take care of business."